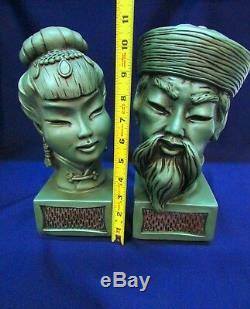 2 Statues Heads Bust Busts Asian Oriental Japanese Faces Green Figurine Rare Old. Thanks for looking at my e. Up for sale we have. 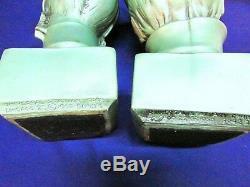 We have a pair of two greenish'pearlized' silvery iridescent very unique color. 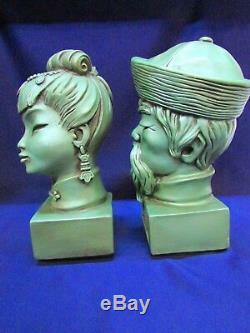 They are large Asian / Oriental / Japanese busts / statues of well dressed heads. Male and female with amazing expressions. These are absolutely unique and rare. 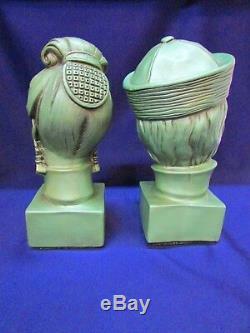 They are stamped "Universal Statuary Corp" Chicago and both are numbered. 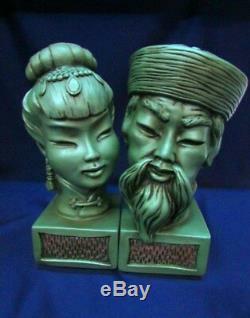 These statues are heavy and can stand on their own or can be used as beautiful bookends. Woman 11" T, x 4.25" W - Male 11.5" T x 4.25" W. I know you will find some pretty amazing things here! Please dont be shy to make a (reasonable) offer! Im going to try my very best to do research and make my prices what the market is going for, but I want to move the items along, and also making my e. Also, if you are looking for something in particular, please contact me and I will look in my unlisted inventory for you and then list it! CONTACT ME If you have any questions or need more pictures You can. Get in touch with me. Ask a question at the bottom left side of page in each. And I will get back to you right away! When purchasing more than one item, be sure to add to your. In the unlikely event an item should arrive broken/damaged, for your protection, b.
I do my best to describe and display my items on. Keep in mind that some older items may have manufactures defects which include: straw lines/crease/fold, light scratching, air bubbles, etc. Which may not always be stated in the description. My pictures are to be used as part of the Condition Description. Friendly Note Since computer monitors vary in color, the actual color of the item may differ from whats shown on your computer screen. Please let me know if you need more time. I greatly appreciate and value your business! I strive to be an excellent. Please contact me first and give me the opportunity to make things right with you before leaving a bad remark. Hope you have a great and blessed day! And remember every day is a special gift from God. 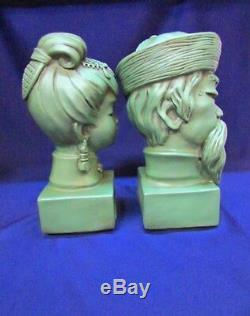 The item "2 Statues Heads Bust Busts Asian Oriental Japanese Faces Green Figurine Rare Old" is in sale since Monday, June 4, 2018. 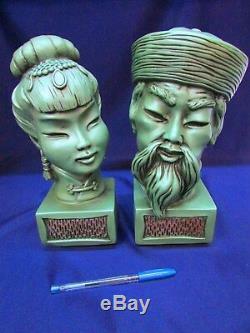 This item is in the category "Collectibles\Cultures & Ethnicities\Asian\1900-Now\Japanese\Figures & Statues". The seller is "weloveusedandnew1" and is located in Berlin, Connecticut. This item can be shipped to United States, Canada, United Kingdom, Denmark, Romania, Slovakia, Bulgaria, Czech republic, Finland, Hungary, Latvia, Lithuania, Malta, Estonia, Australia, Greece, Portugal, Cyprus, Slovenia, Japan, China, Sweden, South Korea, Indonesia, Taiwan, Thailand, Belgium, France, Hong Kong, Ireland, Netherlands, Poland, Spain, Italy, Germany, Austria, Israel, Mexico, New Zealand, Philippines, Singapore, Norway, Saudi arabia, Ukraine, United arab emirates, Qatar, Kuwait, Bahrain, Croatia, Malaysia, Chile, Colombia, Costa rica, Dominican republic, Panama, Trinidad and tobago, Guatemala, El salvador, Honduras, Jamaica, Antigua and barbuda, Aruba, Belize, Dominica, Grenada, Saint kitts and nevis, Saint lucia, Montserrat, Turks and caicos islands, Barbados, Bangladesh, Bermuda, Brunei darussalam, Bolivia, Egypt, French guiana, Guernsey, Gibraltar, Guadeloupe, Iceland, Jersey, Jordan, Cambodia, Cayman islands, Liechtenstein, Sri lanka, Luxembourg, Monaco, Macao, Martinique, Maldives, Nicaragua, Oman, Pakistan, Paraguay, Reunion, Bahamas.